Have you ever wondered how Paradise on Earth may be and have you ever wished to visit it? If your answer is “Yes” then jump on the first flight leaving from Europe to Mahé , the main island of the Seychelles archipelago: you won’t be disappointed and the sublime memory of these magic tropical places will remain impressed in your mind for long time. There’s no better relief during a cold and grey winter day spent in a chaotic and polluted city than letting your fantasy fly thousands of miles away to white coral beaches, lapped by a warm sea whose colours have shades of green and deep blue. 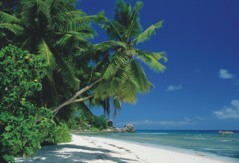 Seychelles have always been one of my most longed for destinations since I served in the army, fourteen years ago. 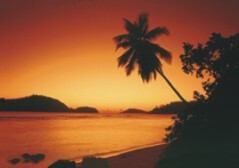 One day I was standing in the guard-room, a squalid and cold room, and something struck my attention: it was a colourful photo of a beach in Seychelles! And now, come on, pack your suitcases and follow me in this fantastic journey to Paradise. The Seychelles Archipelago is situated about 1600 km east of Africa and contains more than 100 islands: the three main islands, Mahé , Praslin and La Digue plus Silhouette e Fregate are granitic while others like Bird, Desroches e Denis are coralline atolls. I suggest to spend at least 5-7 days in one of the smaller and less busy islands like La Digue, Praslin or Bird and then to spend some days in Mahé before leaving; these islands are easily reachable with several daily flights operated by Air Seychelles from the International Airport of Mahé . Flying on a small aircraft few hundreds of meters over the ocean is an exciting experience and the view on the islands and the sea is simply breathtaking. My preferred island is La Digue, small but not too much, quiet and yet lively, rich of small beaches where you can stand aloof: there are almost no cars and the only means of transport are waggons drawn by oxen and bicycles by which you can bike all around the island; also, there are very few hotels and some guest houses. 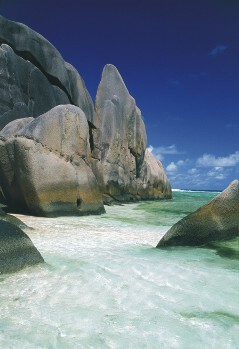 La Digue is reachable by boat from Praslin in 30 minutes. Have you ever seen on travel magazines or advertisements the photo of a white beach with a deep blue sea and huge smoothed down rocks of granite? I guess so and now you know that that’s one of the most famous beaches in the whole world, Anse Source d’Argent at La Digue. I want to tell you that in La Digue I experienced one of the biggest emotions in my life while I was walking on the sand foot path from the harbour to my hotel: it was a mid summer night, there were no lights and it was so dark that I had to be very careful not to bang my head against the trees but the sky was brightened by thousands of stars. Believe me, I had never seen such bright stars before, even in the high mountains! Suddenly the sky was broken by two shooting stars and my wife and I gaped at looking at the sky: they looked like lightning but they were simply shooting stars! La Digue is a real paradise for people who love swimming, snorkeling, trekking or simply getting sunburnt, but also for people who love peace and quiet. 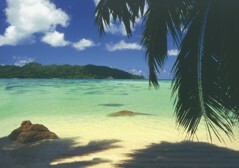 Praslin is the second island in size and is 15 minutes flight far from Mahé . It is mainly famous, besides for the beauty of its beaches and tropical forests, for the Vallée de Mai, the only place on Earth where the Coco-de-Mer’ grows: it is a gigantic coconut whose shape is very similar to a woman’s pelvis. And finally Mahé is worth a visit of several days: it is the largest and most important island and its capital, Victoria, is a picturesque city with a colourful market. Even though there are several asphalt roads, traffic is not chaotic. There are many hotels but they’re very isolated and each of them has its own private beach: forget the photos you may have seen of Acapulco, Cancun, Miami, Rio de Janeiro or other famous resorts where you can find long beaches with thousands of people and surrounded by hotels as high as skyscrapers: Seychelles are totally different and your privacy is always guaranteed. I suggest not to idle all the time on the hotel beach but why not to rent a car and discover some of the hundreds of small beaches aloof? Believe me you won’t regret it, but be careful since in Seychelles you have to drive on the left like in UK! 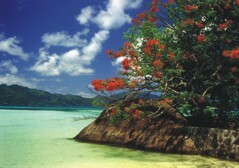 Another thing you must not miss is the Sainte Anne Marine Park which is rich of colourful fishes. Well I’ve got no more space available for my article but I want to end it reminding you that “Seychelles have all the colours of a rainbow, the blue of the sky, the green of the palms and of the luxuriant vegetation, the white of the coral beaches, the deep blue and light green of the sea, not to mention the underwater rainbow made up of millions of colourful fishes”. Language: The official language is Creole; English and French are widely spoken. Electricity: 240 volts AC, 50Hz. British three-pin plugs are in use. Mobile telephone: GSM 900 network. Passports: Passport valid for six months from date of arrival in the Seychelles. Visas: Visa not required by any nationality. Currency exchange: Exchange facilities are available at the airport banks and local banks. Credit & debit cards: American Express and Visa are widely accepted; MasterCard and Diners Club have more limited use. Exchange rate: At November 2002: 1€ (Euro) = 5.6/6 Rupees. International air connections: The Seychelles’ national airline is Air Seychelles (HM). Other airlines flying to the Seychelles include British Airways, Air France, Air Mauritius, Air Europe, Kenya Airways and Aeroflot. Approximate flight times: From Mahé to London is 12 hours (10 hours direct). Weather: The islands lie outside the cyclone belt but receive monsoon rains from November to February with the northwest trade winds. This hot and humid season gives way to a period of cooler weather, though the temperature rarely falls below 23°C, and rougher seas when the trade winds blow from the southeast (May to September). The driest time of the year is from June to September.